Sister Jean Dolores Schmidt and Father Rob Hagan have been getting a lot of attention these days in the national media. They are the chaplains for the two Catholic teams, Loyola University Chicago and Villanova University, playing in the Final Four of the NCAA men’s basketball tournament this weekend. It would be possible in a celebrity-mad culture that tends to see human beings as having value to the extent they are winners to regard Sister Jean and Father Rob as simply having the luck of the Irish. That is, to conclude that they are getting their 15 minutes of fame because they are attached to winning basketball programs. However, they matter far more than that. In this case, they are reminding us that both faith and culture are important. With regard to culture, they are heirs of a tradition that has tended to accept play and take it seriously intellectually. St. Thomas Aquinas asked in his “Summa Theologiae” if there can be a virtue about games, and he answered, “Yes.” For Thomas, virtue had to do with moderation, and therefore a person should not be working all the time. A fully human life also needed time for recreation and relaxation, which is what play and games provided. This ethic has influenced Catholic cultural and educational traditions right up to our own time. Sister Jean and Father Rob love basketball, and they are clearly happy to be walking with young people as they play the game. He encouraged the team to stay humble and “stay connected to the one who truly strengthens us. Stay connected to each other.” A few hours later, after Villanova had won the national championship, Father Rob brought them back to the same theme. The institutional character of Catholicism helps the faith dimension to be sustained and keeps it from collapsing into the value orientations of American culture at a particular moment. Sister Jean and Father Rob’s vocations connect them to a faith community that spans two millennia and extends around the globe. This is a tradition that has its own embodied rituals and its own history of theological and spiritual reflection. Religious studies scholars have written a great deal about sport itself having become a folk or civil religion in the United States. This religion is an expression of “the American way of life,” which places a high value on success. Theologians have also criticized what they call “sportianity,” which values winning more than genuine Christian values. When their teams and fans arrive in San Antonio this weekend, Sister Jean and Father Rob will be participating in all of the rituals associated with the Final Four. But I can assure you they will also be participating along with many players and fans from their universities in other rituals they know are even more important in memory of Jesus — the one who laid down his life out of love for us and invites us to love one another. He even promises us that living in this way this will lead to a joy that goes beyond the joy of winning a national championship. Now that is good news. And that is what the lives of Sister Jean and Father Rob are a reminder of to the young people on their teams — and to all of us. Jesuit Father Patrick Kelly is associate professor of theology at Seattle University. 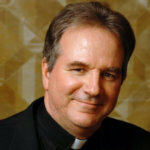 He is the author of "Catholic Perspectives on Sports: From Medieval to Modern Times." He is a guest columnist for Catholic News Service.